Howdy folks. I thought that for today’s post I’d follow on my recent post on playing barrés (or barré chords) with another on some additional tips for getting your fingers around this technique. Just to recap, I suggested that you need to think about using the bigger muscles of your arm, its weight and gravity to create the pressure required to sound the notes. And instead of pressing hard between finger and thumb, actually remove your thumb from the guitar neck and think about moving your hand in toward the neck of the guitar. Yes, don’t be clamping that thumb down like you’re pressing a thumb tack into the wood! You don’t have to keep the thumb away from the guitar neck completely and all the time. In fact that may add undue tension itself if you do that to actively. Think about just relaxing the thumb, and just resting it, just placing it on the back of the guitar neck to provide balance and an easy, relaxed touch point (whilst putting into practice previous advice around using the weight of the arm and larger muscles groups). The thumb is still not actively involved, per se, in producing the barré, but provides a resting point for your thumb. Thinking about the thumb in this relaxed manner can also help with thinking about the rest of the hand and fingers in a relaxed manner too. This one kind of depends a little on the make up of your fingers, but most folks have a harder, bonier outer edge to their first left hand finger and a plumper, fleshier underside. Rotate your first finger slightly towards the outside of the fingers, on the harder, bonier part of the finger – this should make the barré a little easier to produce because (a) it’s a nice, relatively hard surface and (b) you’re not contending with (or contending less with) the grooves of the inside of your knuckles. That is to say, the strings will have less of a tendency to slip into those grooves and produce that oh-so-annoying thunking or buzzing of a string not quite down fully. Ask yourself the questions – do I need to keep this whole barré down all the time? Do I just need a half or partial barré? Can I change from full to partial or vice versa? Where are the pauses or more relaxed points in the music where you could relax the barré temporarily before reapplying? Another important question to consider is do I need to apply equal pressure across the whole six strings? Have a look at which strings you’re playing and when. See if you can, in fact, selectively apply pressure to those strings in the barré only as you need them and relaxing the finger or fingers elsewhere. 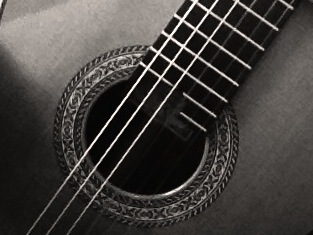 Next postWant To Play Spanish Classical Guitar? Listen To This…. Very helpful post specially on this technique.